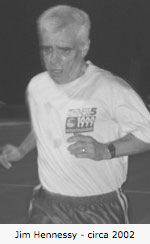 Jim has been a member of Kembla Joggers since 1974 where he competed and ran at a very high level. Note his times as a veteran athlete, which most KJs have not matched in an open category… 9miler 50.32 (age 35), 5km track 15.20 (at age 38), 10km track 32.14 (age 38) and the 1 hour run of 17km 190m at age 40. Jim also competed regularly in Veteran’s Championships both national and international, winning many medals. In addition to being an elite athlete, Jim has held the executive position of Treasurer and General Committee positions of Handicapper and Social Secretary in addition to Refreshment Organiser and Race Organisation Team Member. Jim is one of the longest serving current members of the committee. From those early days with our club Jim exhibited those special qualities of club loyalty, dedication and willingness to get in and help whenever needed. He often surrendered his opportunity to race whenever we were short of marshals and regularly marked out race courses hours before members arrived to compete. He always said ”marshalling duty is everyone’s responsibility and should be carried out in order to appreciate what goes on in the background” How true is that? Jim has been on the Fitness 5 committee since it’s inception 22 years ago and part of the race organising team for the ANSW Road Relays for the past 9 years. Jim was also a driving force behind the formation of KJs Veteran’s Movement that has morphed into our Thursday Night Track Racing. He is our resident race starter and rarely misses a Thursday night at the track. Jim played a big part in the organisation of our very successful 25th Anniversary celebrations in 1998 and this was where he received his life membership for outstanding service to the club. As a competitor Jim always gave 110% and was highly respected by his peers. As a devoted Kembla Jogger, he is still giving 110% even though he can’t run any more.